Whether you’re interested in personal or professional fulfillment, an MBA degree can be the answer. Challenge yourself, and see the rewards ripple throughout your life. Women are benefiting from an MBA like never before. 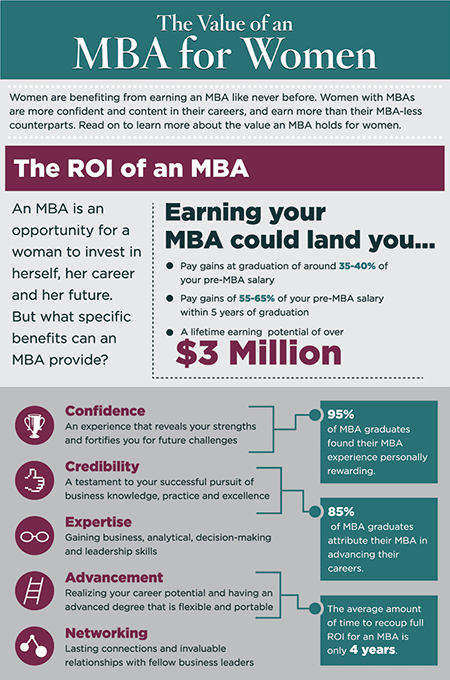 Women with MBAs are more confident and content in their careers and earn more than their MBA-less counterparts. While an MBA is an opportunity to invest in yourself, your career and your future, what specific benefits can an MBA provide?